The Da-Lite 81.5 x 192" Da-Snap Projection Screen is a fixed frame screen that is suitable for business or personal use. Using the snaps or optional touch fastener tabs, you can easily and readily change the screen surface to accommodate your need. 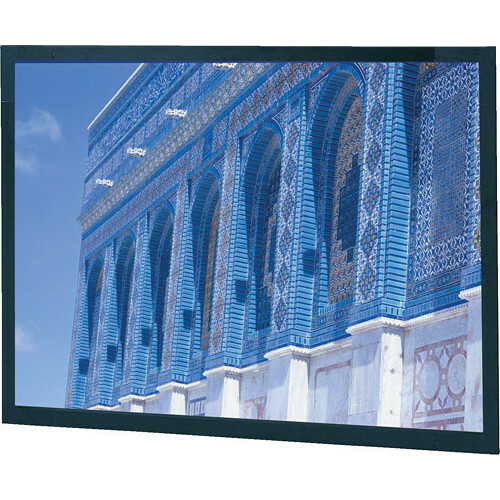 The screen finish is mounted to a rugged frame that features a black masking border. The border provides a finishing touch to the screen and helps keep your audience focused on the screen. For the business person on a budget or with a smaller seminar room, the Da-Snap is the perfect solution. When a motorized installation is not feasible or desired, the Da-Snap fits the bill. Easy to use, economical and flexible, this affordable and functional screen provides a solution by offering you a simple audio-visual projection set up. Note: Pro-Trim is a smooth, felt-like material similar to the surface of a pool table. It helps absorb any light that surrounds the picture area and provides the screen with a lovely finishing touch of elegance. Box Dimensions (LxWxH) 107.0 x 12.0 x 10.0"